BOSTON -- Frederik Andersen settled the puck behind his net, patiently faked out the hard-charging Brad Marchand and zipped a pass beyond Patrice Bergeron to clear the defensive zone. 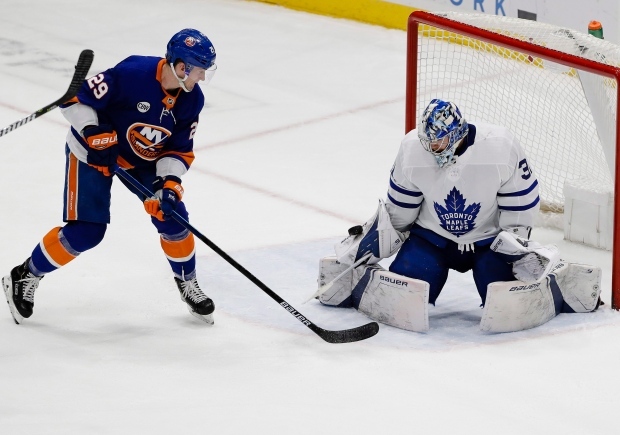 It was a subtle sequence in the third period of the Maple Leafs' convincing 4-1 victory over the Boston Bruins in Game 1 of their first-round playoff series. It was also a move Toronto's goalie might not have even attempted a month ago. Andersen, who was exceptional in making 37 saves to help secure Thursday's triumph, endured a miserable March -- a confidence-sucking stretch where the Leafs, all but locked into their matchup with the Bruins, didn't have a whole lot to play for. Pucks were going in off teammates and sticks from weird angles, but more troubling was that Andersen looked out of sorts. Usually cool in his crease, the 29-year-old seemed antsy. Waiting for the play to develop is one of Andersen's strengths. During those wobbles where his save percentage sat at just .874, he was often caught chasing the play, guessing what was coming next instead of using his instincts to react. Andersen had gone through similar stretches in the past, and knew he would come out on the other side. But with the clock ticking down towards the playoffs, it was a matter of "when." "You try to simplify things and make your focus be on shorter-term things," Andersen said Friday. "Even when you're doing well, you want to keep your focus on your next five yards instead of on the next mile. "You shorten down your goals and focus on what you can do right in the moment." Against the Bruins on Thursday, he was at the top of his game, cooly snapping out a glove or pad to deny Boston shooters. His third regular season as a Leaf ended with a record of 36-16-7, a 2.77 goals-against average and a .917 save percentage in 60 starts. The overall numbers were similar to his first two campaigns in Toronto, but he wound up making six fewer appearances than in 2016-17 and 2017-18, largely because of a groin injury that kept him out of the lineup for nearly three weeks and no doubt impacted his mobility at times. "You just work through it," Andersen said of those March struggles that started to evaporate once the calendar flipped to April. "You go through different periods where it goes better for you (and) sometimes it doesn't go as well. You learn from it and you keep pushing. "Sometimes the puck's not following you." "Freddie is a guy we trust," Toronto head coach Mike Babcock said. "Freddie's a guy who's a real leader on our team, who works hard and is proud of what he does, and obviously wanted to get his game back and he did." Leafs defenceman Jake Muzzin, who knows about championship-calibre goaltending from his two Stanley Cups with the Los Angeles Kings, said Andersen's demeanour helps set him apart. "He's calm," Muzzin said. "He made the saves when we needed them." "He's pretty good at staying steady with his mindset," Leafs winger Connor Brown added. "We knew he'd be ready for us. We weren't doing him a lot of favours down the stretch (in the regular season)." Andersen, who had an .896 save percentage in last year's playoff defeat to the Bruins, will likely be under siege early in Saturday's Game 2 against a desperate opponent that knows losing a pair of contests at home to start a series is often a death sentence. The Leafs, meanwhile, won their first Game 1 since 2003 and will be looking to go up 2-0 for the first time since 2002. Toronto hasn't won two games on the road to open a series since 2001. "We need to elevate our game again," Leafs centre Auston Matthews said. "We know they're going to come out ready." Toronto did a good job limiting the line of Marchand, Bergeron and David Pastrnak -- the trio combined for 30 points against the Leafs last spring -- at 5 on 5 in the opener. Bergeron scored early on the power play to give Boston a 1-0 lead, but both Andersen and the Leafs stayed the course. "You're going to let in a goal, you've got to focus on what's coming next," he said. "You don't get a chance to get it back. Now is not the period to analyse it. "You've got to try to reset as quickly as possible." And that next challenge is coming fast.